I'm so excited to share this finished quilt with all of you! My Top Spin quilt is done! I started this quilt in 2016 as a leader and ender project. The pattern is by Melissa Corry for Moda Bake Shop! 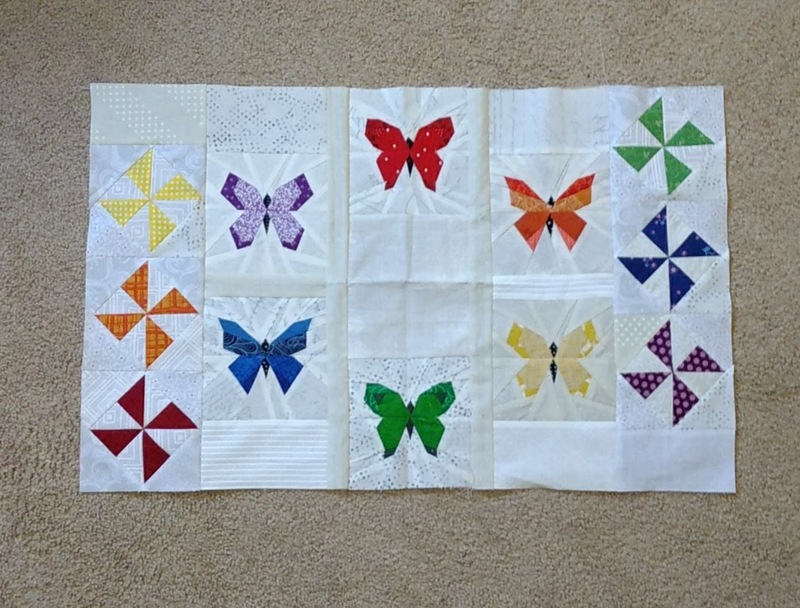 The original pattern uses 64 blocks for a queen sized quilt and I made 48 blocks for a twin sized quilt. 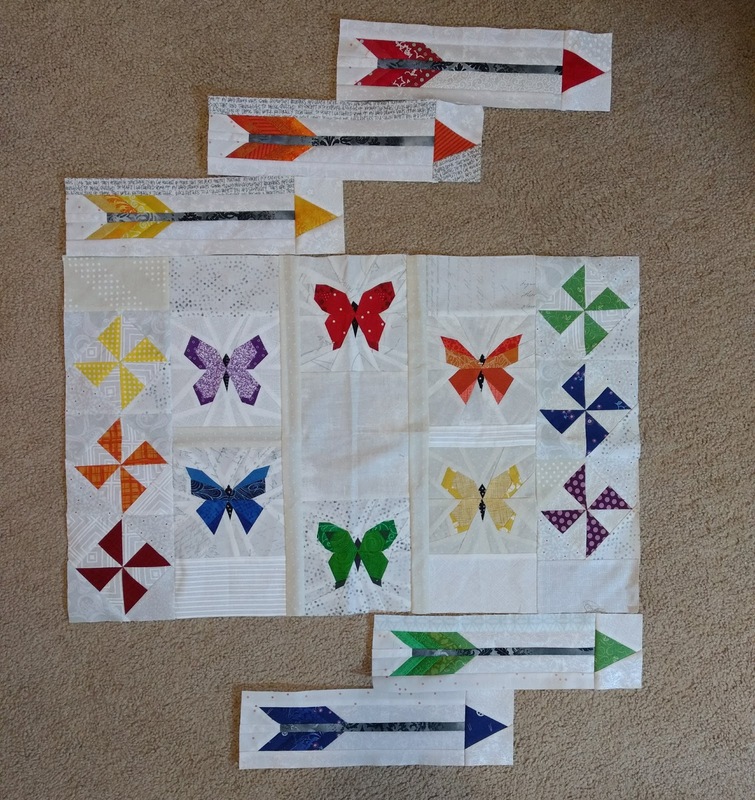 I took this quilt to Michigan over Christmas and told my mom that she could do whatever she willed with the quilt -- either take it with the next batch to her long arm quilter or quilting it herself on her mid-arm. She decided to quilt it on her mid-arm and practice her ruler quilting and the results are gorgeous! In the grey background areas she did straight line ruler quilting and in the colored HSTs she did a loopy meander -- this is exactly what I had envisioned for the quilt! The thread she used is actually a variegated grey, which you can see in some of the photos. The backing is from the HBD Shop and is a plum dot extra wide fabric and my mom also used it for the binding. I really like the purple-y frame around the mostly-grey quilt. The next person who comes to visit us will get to use this quilt in the guest room! 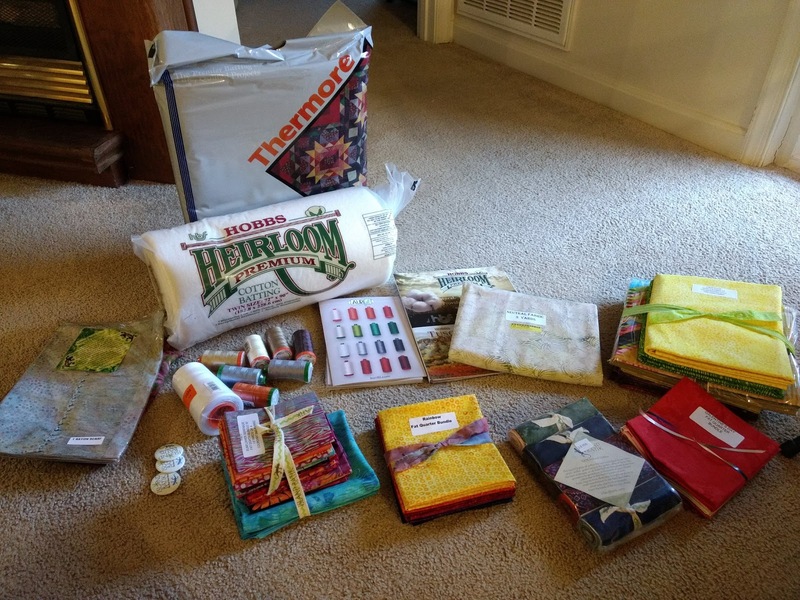 Sharing at Finish it up Friday Oh Scrap!, and Needle and Thread Thursday! 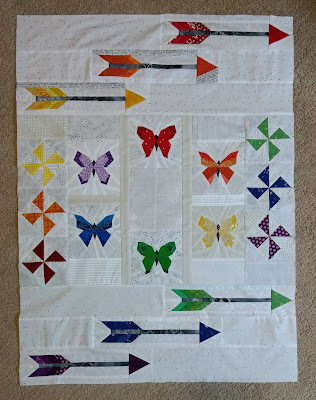 This year for the Coast to Coast Traveling Bee (C2C Bee) I am working on Audrey's quilt first. This year we're rotating our quilts "backwards" from last year -- last year I had Audrey's quilt last! While flying geese were easily the first thing that popped into my head, I also thought of pinwheels! My initial thought was to add on-point pinwheels on each side and then larger blocks on the top and bottom. Originally I had planned to add six smaller pinwheels on each side, but decided to put three on each side instead. I used some of the Art Gallery Fabrics that I used for an upcoming secret sewing project to sash together the arrows to the centerpiece. I absolutely love those metallic dots! This quilt really grew! It started off as about 17 inches square and now it's approximately 26 inches wide and 35 inches long! This quilt will be sent off to Stephanie of Quilt'n Party this weekend! 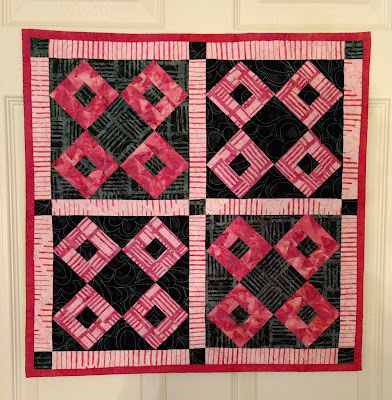 Stephanie had my quilt this round and she added a row of bright log cabin blocks! 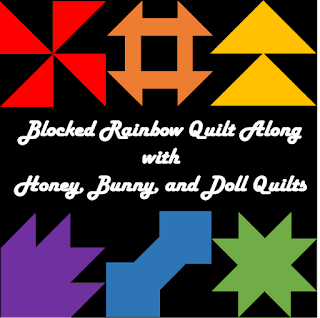 Don't forget to join our Blocked Rainbow QAL starting March 19th! 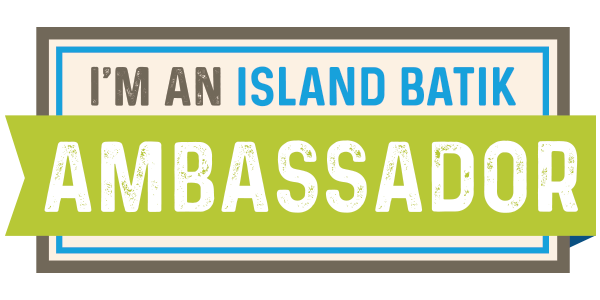 Join the Facebook Group for chat, hints, and laughs! 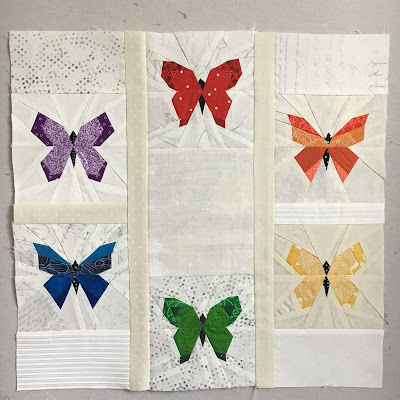 Sharing at Finished or Not Friday, Oh Scrap, and Linky Tuesday! Our quilt along for 2018 is .... Blocked Rainbow! This quilt along will use the Rainbow Sampler pattern originally featured in Issue #5 of Modern by the Yard. 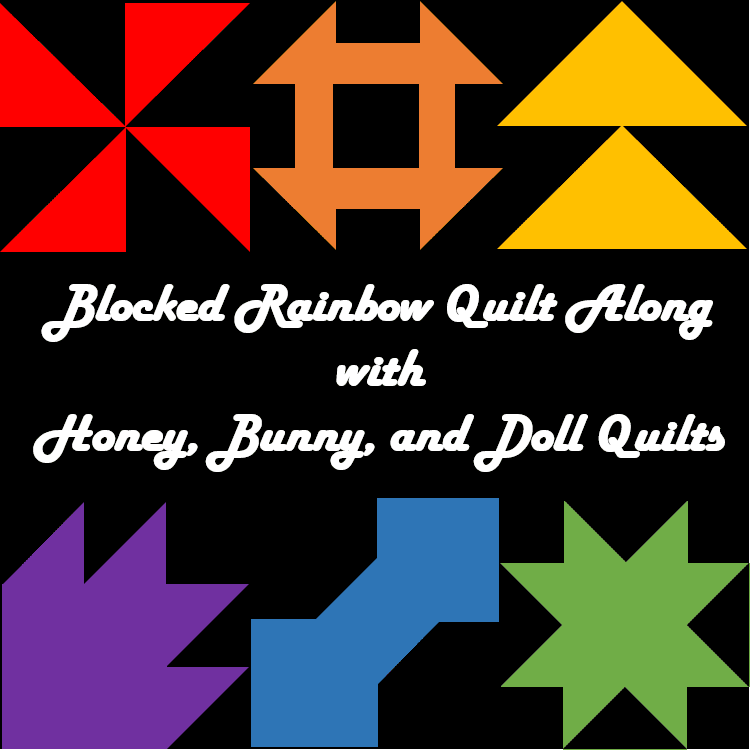 This quilt along will also offer an enlarged version of the original pattern for those who would prefer to make a twin sized quilt using larger blocks. This quilt is perfect for confident beginners as it will use a variety of different techniques to make classic blocks. I'll also include lots of tips along the way -- including how to make a scrappy version of the quilt! 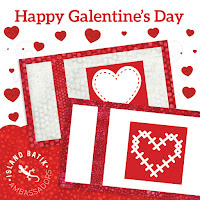 We look forward to quilting along with you this year! 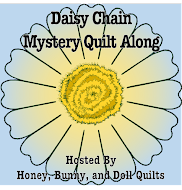 Join our Honey, Bunny, and Doll Facebook group for quilt along chat, giveaways, and laughs! 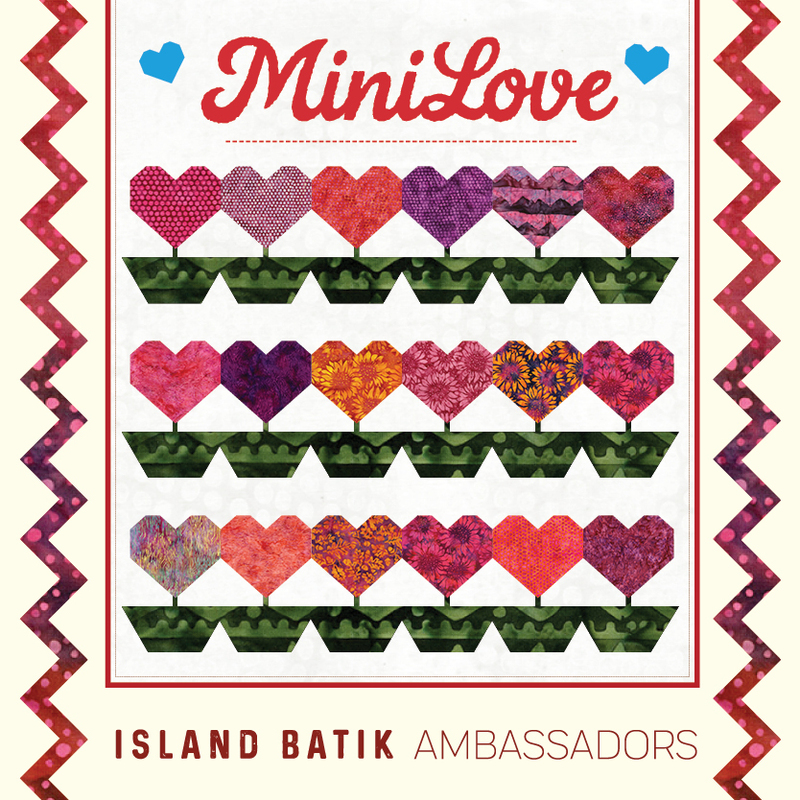 February is all about minis for us Island Batik Ambassadors and since February is all about love, I thought I would make another pink mini! 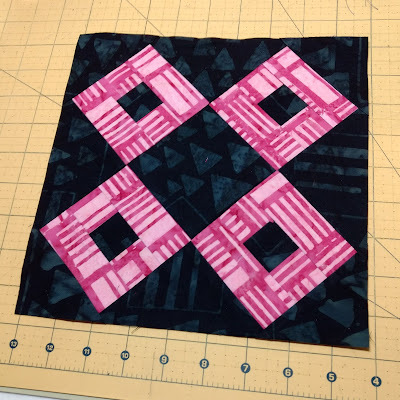 I decided to use our Four Square block pattern to make a mini similar to my sister's mini using some of the fabrics from the Elementz 10" square stacker that I received from Island Batik in my newest shipment! This pattern is designed to make efficient use of 10" squares so it's perfect for this fabric. I pulled out some of the pink and black/grey fabrics, staying with the Valentine's Day theme this week! 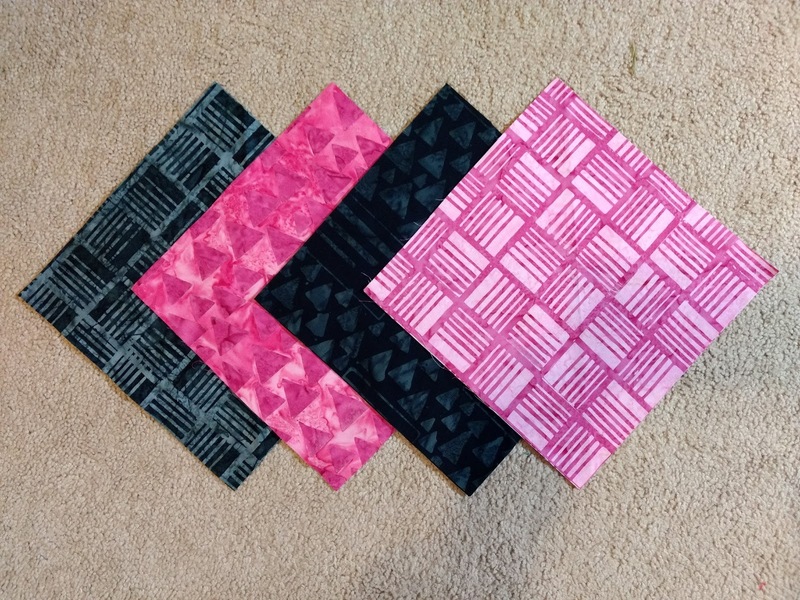 Since the fabrics come in pairs, I pulled two different pink prints (four squares total) and two different black/grey prints (four squares total) for the four blocks. 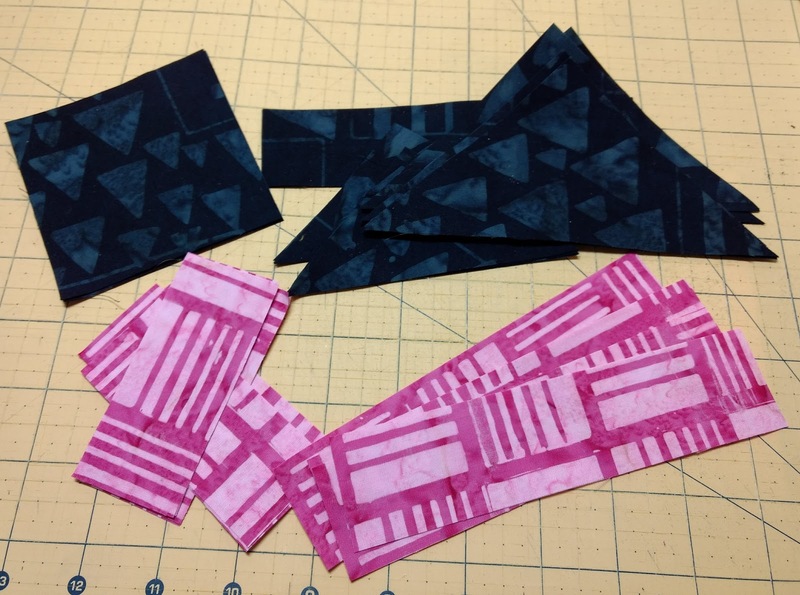 These blocks go together quite quickly -- especially when you make them in pairs! 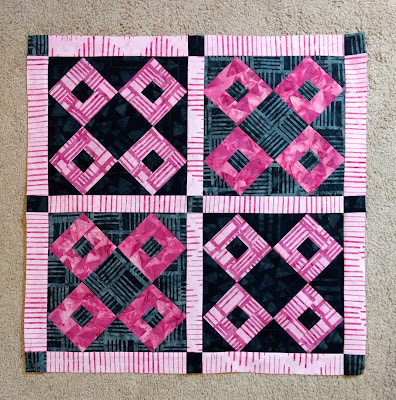 I used two more pink 10" squares to cut 1.5" wide sashings and used the black scraps to cut corners tones for the mini top. 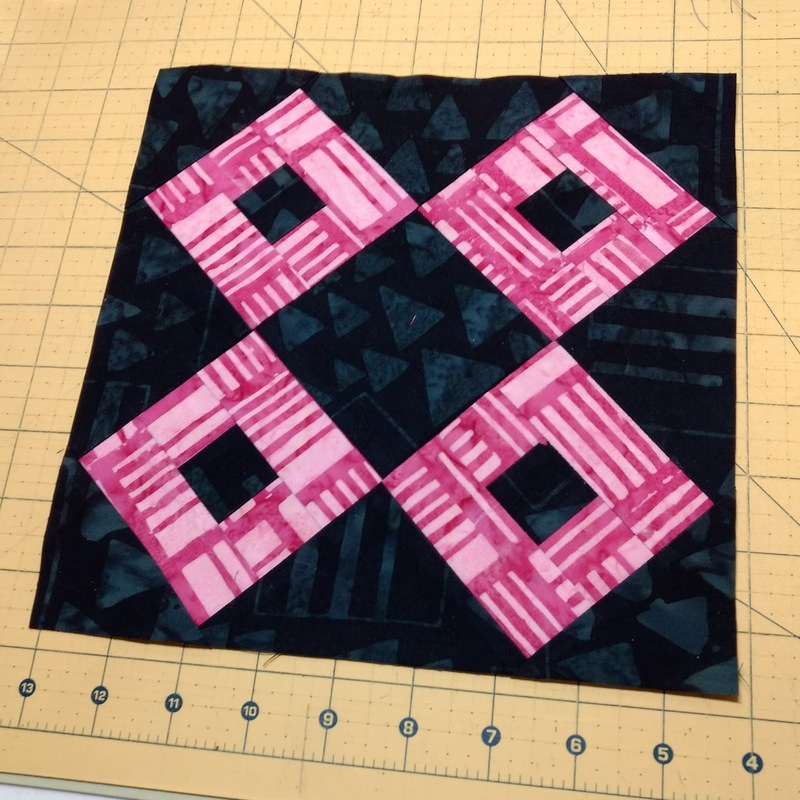 I decided to go a little wild with the backing -- I pulled six additional 10" squares from the Elementz stacker to make a pieced backing echoing my Four Square blocks. These are the brightest fabrics from the bunch! For the quilting, I did a flower-type filler motif with the "base" of the flower as an oval or teardrop instead of a circle or a swirl. 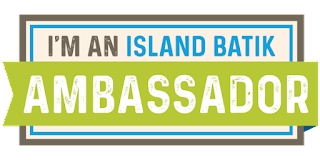 I used one of the light grey threads provided by Aurifil in my Island Batik Ambassador box and it was a great choice! 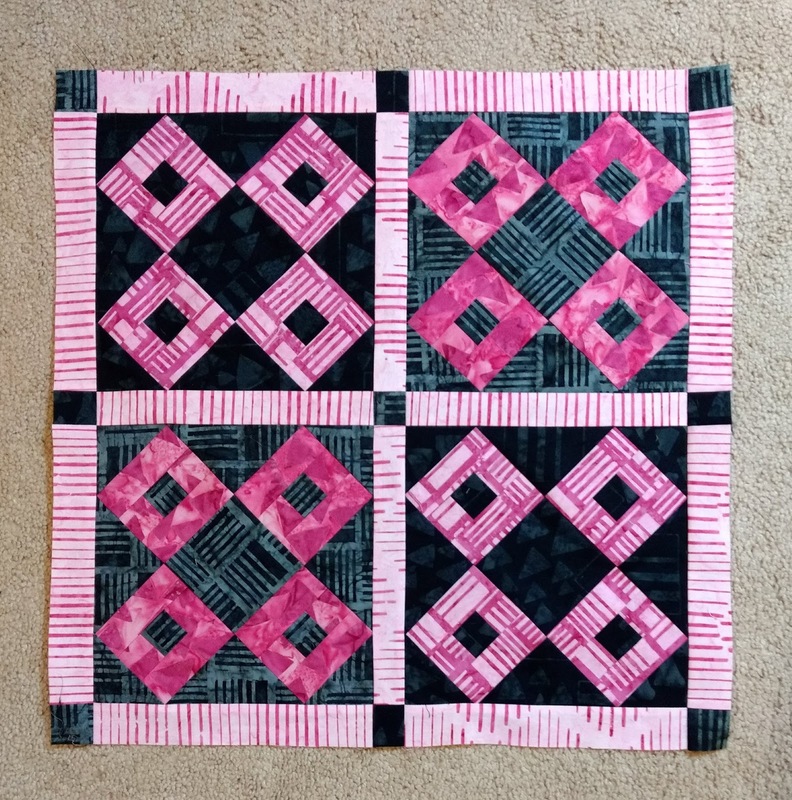 I like the way that it contrasts both the pink and the black in the mini quilt top. I used a hot pink fabric for binding (and was able to bust out some hot pink thread too!) 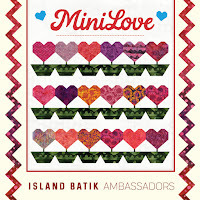 and now this mini is hung up on our office/den/guest room/sewing room door! Even thought we're past Valentine's Day, I'm going to be leaving this pretty little thing up until March! Click on over to Craftsy to pick up the Four Square pattern for yourself! 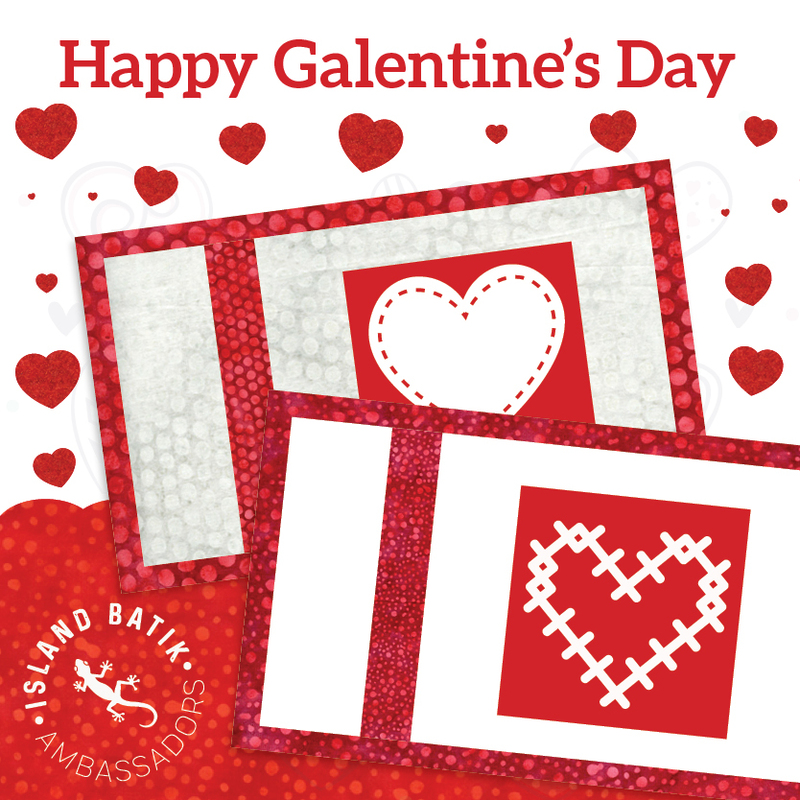 Like last year, us Island Batik Ambassadors have been tasked to make some Galentine's Day themed mug rugs! Included with our amazing first shipment from Island Batik were some lovely red and pink fat quarters provided for this month's mug rug and mini projects! I also used some lovely threads from Aurifil! If you remember from last year, I made a Parks and Recreation themed mug rug. This year I figured I would do the same and start a little collection of my favorite quotes from the show. This year's quote is "I love you and I like you" which is originally from the episode where Ben and Leslie get married. Let's get sewing! I used the cream and hot pink fat quarters for this mug rug. I cut 9" and 8.5" squares out of the cream and cut a heart out of the hot pink fabric. I used one of my decorative stitches on my machine to do the machine applique stitching in red Aurifil. I used cream Aurifil from my newest box to quilt "I love you and I like you" on the heart. Parks and Recreation fans will know this is from the wedding episode! 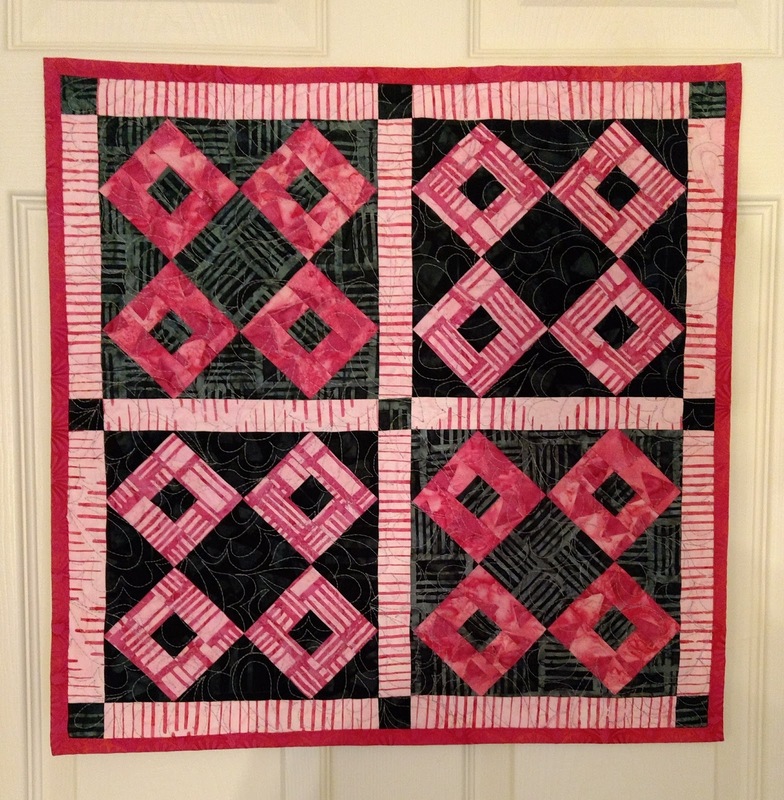 I quilted loops around the heart in the background and bound it with the hot pink fabric. Here are my two minis together! 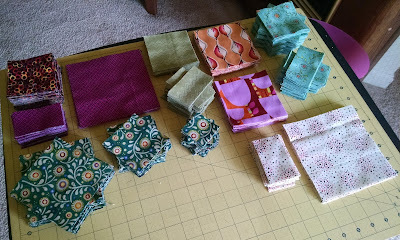 Come back on Friday to see another pink mini quilt project that I've been busy working on! Hip hip hooray, this quilt is finally done! 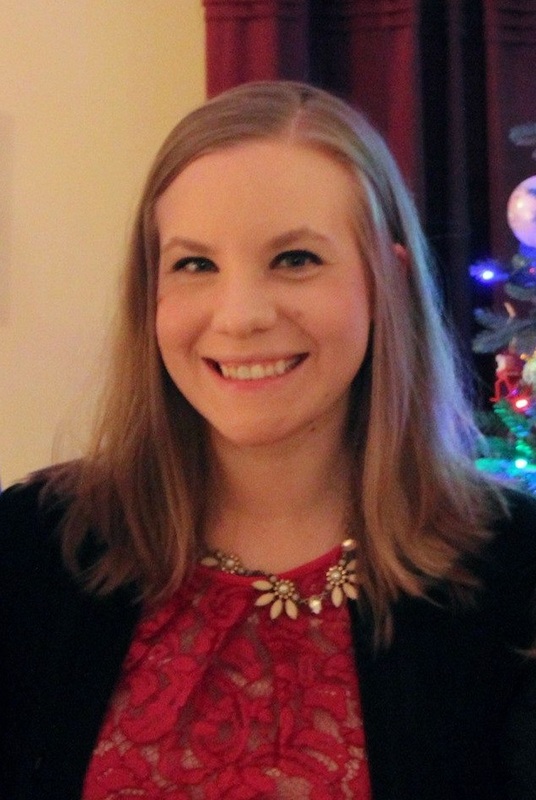 But alas, it's been nasty weather here and I'm not willing to take it outside in the mud, so indoor pictures it is. This quilt was part of the Gathering QAL hosted by Cora's Quilts last year. I pulled all of the fabrics from my stash other than the Kona Oyster background fabric -- which is pretty impressive considering this is a queen-sized quilt! That's the binding for a queen sized quilt (10 WOF strips, for reference) wrapped around a slightly used spool of Aurifil thread. I have no binding baby and, to be perfectly honest, most of the time I don't press my binding before I sew it to the quilt. Yes, I hear some of you gasping! It was 100% necessary for this quilt and I'm glad I took the time to do it this time around. For this quilt, I decided to hand stitch it to the back instead of machine binding it. 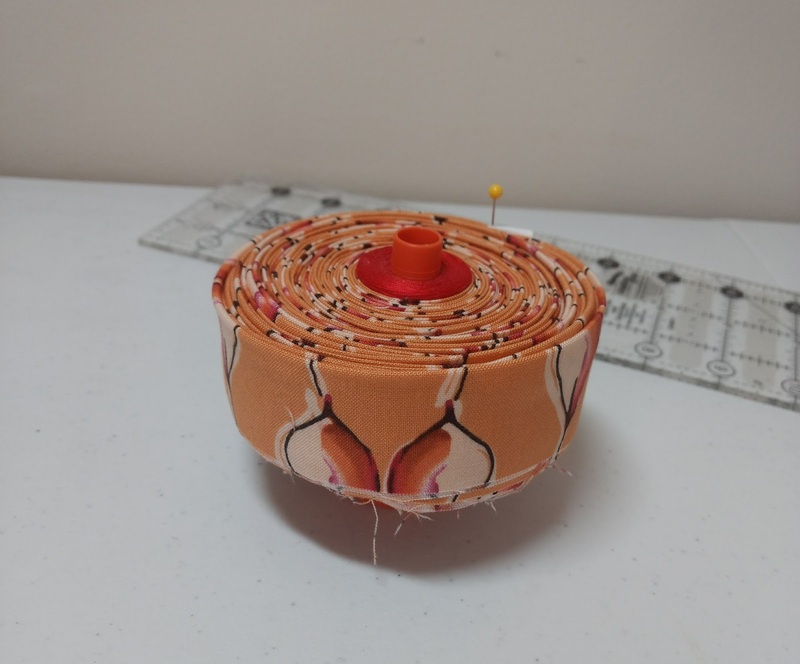 The peachy orange fabric that I used was also used in the quilt top and is an old Kathy Davis print. This will be my spring bed quilt -- once it warms up and I don't need a flannel quilt on the bed anymore! Sharing at Finish it up Friday! Don't forget to join our Facebook Group to get a sneak peak of our upcoming quilt along!